Virginia is getting ready for the monthslong closure of six Metrorail stations on the Blue and Yellow lines. Here's what you need to know. Virginia will spend $3.6 million to let buses run past traffic on part of the Capital Beltway, discount Amtrak trips for VRE riders and to support expanded bus and water taxi service during this summer’s monthslong Metro shutdown of six Blue Line and Yellow Line stations. The Commonwealth Transportation Board rushed to approve the funding Thursday, as Alexandria, Fairfax County and the Potomac and Rappahannock Transportation Commission in Prince William County finalized their plans to limit the traffic slowdowns from Memorial Day to Labor Day, which are expected as a result of the closures of all stations south of Reagan National Airport. Work to repair crumbling concrete platforms and make other fixes is scheduled to close Braddock Road, King Street-Old Town, Eisenhower Avenue, Huntington, Van Dorn Street and Franconia-Springfield stations from May 25 through Sept. 2. “The travel impacts to the public are going to be significant,” Alexandria Director of Transportation and Environmental Services Yon Lambert said. Some 17,000 people enter those stations in a typical morning rush hour. A typical highway lane carries only about 2,000 cars per hour. Construction to convert the Interstate 395 HOV lanes to toll lanes will also still be underway, with the project not due to be completed until October. “So this is significant and the impacts that we could see to the traveling public in Northern Virginia could also be significant,” Virginia Department of Rail and Public Transportation Chief of Public Transportation Jennifer DeBruhl said. That would include impacts on drivers, Metro and bus riders, and Amtrak and VRE users. By Sept. 2, work is scheduled to be complete on the platforms at Braddock Road, King Street and Eisenhower Avenue. While train service is then scheduled to resume south of Reagan National, platform work is scheduled to continue into the first week of October at Van Dorn Street and as late as the first week of December at Huntington and Franconia-Springfield. Riders at those stations will see the work, but Metro does not plan major rush-hour service disruptions. The options Virginia is funding range from buses and bikes to water taxis, traffic light changes and carpool promotion. The state is covering $3.6 million of the $4.4 million costs for the services, each of which is beyond what Metro is offering with free shuttle buses and some additional service on existing bus routes. VDOT plans to spend about $100,000 itself, partly to allow buses on the shoulder of the Outer Loop of the Capital Beltway between the Eisenhower Avenue Connector and Telegraph Road to keep buses moving. Buses already run on part of the shoulder along the Dulles Connector Road and Interstate 66, effectively creating a bus lane on the highways when there is significant traffic. The state is also changing pavement markings and traffic light timing around the Huntington Metro. More than half of the state spending total is earmarked for Alexandria where the city plans extra DASH buses, expanded King Street Trolley hours, rush-hour water taxi trips between Old Town and The Wharf in D.C., extra bike-share service, and improvements to traffic lights, closed-circuit cameras and police deployments to keep shuttle buses moving. DASH has already picked up extra buses from New York to run during the shutdown. 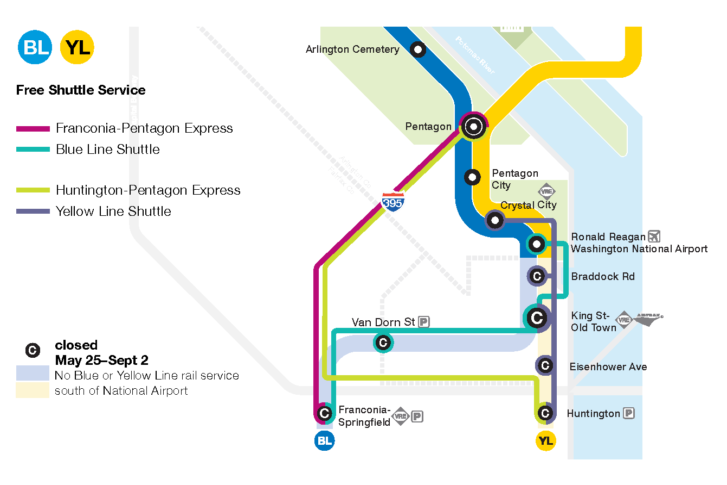 Fairfax County has the next-largest share of funding for extra Fairfax Connector service and a possible shuttle at the Huntington Metro station, if needed, due to extra construction there. With the Metrorail stations closed, SmarTrip machines will also be cut off, so Alexandria hopes a new DASH mobile payment app will be useful to riders. In Prince William County, PRTC OmniRide plans free shuttles from park-and-ride lots that usually have lots of empty spaces to and from the Rippon and Woodbridge VRE stations to allow more riders to board there. To create room on the busiest VRE trains and provide more express service, the state plans to slash the cost of Amtrak step-up tickets for monthly riders from $8 to $4 per trip, at a cost to the state of about $200,000. The region also plans increased pushes for flexible schedules, carpooling and vanpooling. After the shutdown is over, the Northern Virginia Transportation Commission plans a significant marketing campaign meant to get riders back. Out of Metro’s 45 outdoor stations, some 20 need major platform fixes quickly. Twelve of those stations are in Virginia. “This is only the beginning,” Debruhl said. In Virginia, Orange Line shutdowns for platform work and I-66 toll lane construction are planned in summer 2020 at Vienna and Dunn Loring, followed by work at West Falls Church and East Falls Church in fall and winter. “The Orange Line is going to be next year. That is also when we’re going to have construction going on I-66 and so we are also mindful of that and hopeful that these strategies will also inform what we can do next year to help mitigate those potential impacts as well,” Department of Rail and Public Transportation Director Jennifer Mitchell said. Metro also plans similar work on the Green Line in Maryland in summer 2020 at West Hyattsville, College Park and Greenbelt. Metro has planned additional work at Rhode Island Avenue on the Red Line in September 2020, followed by work in 2021 at Cheverly, Landover, New Carrollton, Addison Road and Arlington Cemetery.